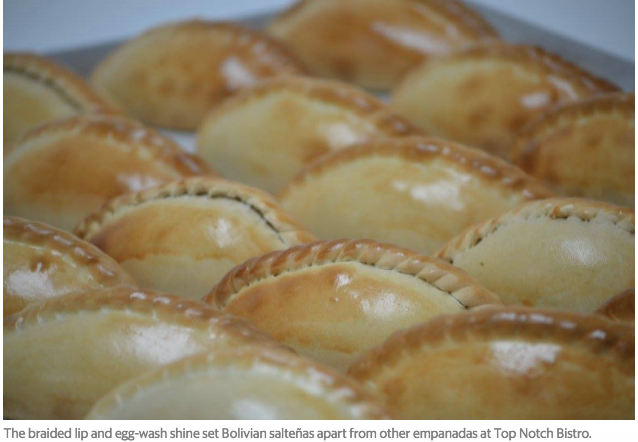 Miami: Love empanadas but haven’t tried Bolivian salteñas? If you’re craving empanadas, but also want something a little different, Top Notch Bistro has the answer: meaty, homemade Bolivian salteñas. 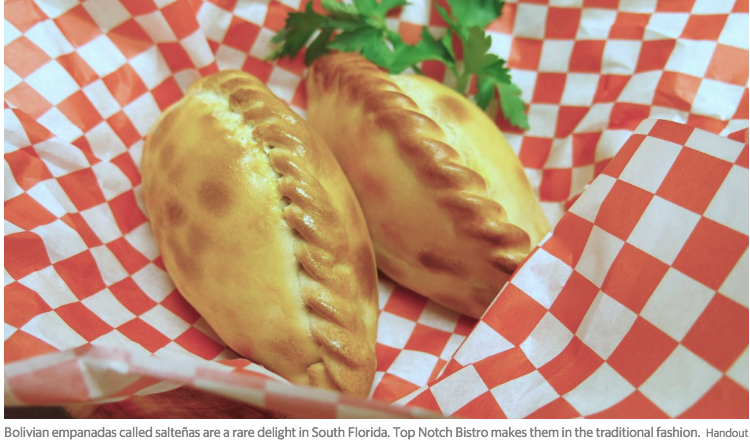 Bolivian restaurants are rare in South Florida, so it’s a treat to find a restaurant that makes these Bolivian-style empanadas. Fausto G. Arroyo, who grew up in central Bolivia of native Quecha descent, gave up a career in banking two years ago to bring South Florida the salteñas of his homeland. (Salteñas were first made by Juana Manuela Gorritia, a feminist and journalist in exile from Salta, Argentina in Tarija, Bolivia, thus the name.) With the help of his wife, Arroyo has been quietly spreading salteña pride throughout South Florida, including catering the Super Bowl. The thing to get here are the small, football-shaped salteñas. The traditional meat empanadas have pitted olives, hard boiled eggs and raisins and are seasoned with onion, paprika, cumin and aji amarillo. They have other fillings, including spicy beef, spinach and cheese, double cheese, ham and cheese and pork. The pan con llajwa (pronounced ya-hua) is a fresh homemade bread with a spicy sauce for dipping. The traditional Bolivian sauce is similar to a salsa, with locoto chiles and cilantro. Sweet potato fries and baked garlic broccoli make for great, additional starters. Several sandwiches on the menu are made for splitting and sharing. There’s the beef medallion sandwich with pan-fried onions on a soft Portuguese bun. The Top Notch steak with salad and cheese is served on a baguette. 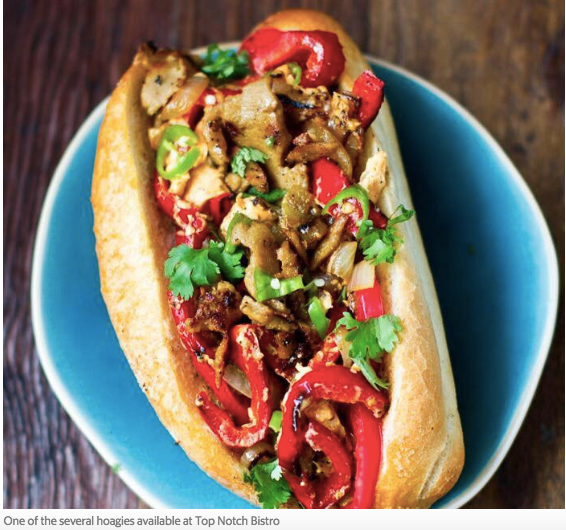 The Philly chicken cheese in a hoagie is another favorite. For our money, we say double down on the salteñas. Get two with a side of fried eggs. Dining with someone a bit less adventurous? The Top Notch burger is a half-pound patty with all the fixins. Those watching their carbs can ask for the Garden Burger, served on a salad, without the bun. Main plates include Bolivian-style pulled pork, seasoned with cumin, chiles and coriander. There’s also a 12-ounce New York strip steak and the house specialty, beef medallions, slow cooked in rosemary sauce. Bolivian-style chicken breast is cooked in the house seasonings and served with an onion sauce. Try the house made passion fruit or Key lime mousse. Hours: Monday-Saturday 11 a.m.-8 p.m. This entry was posted in Bolivia and tagged Bolivian cuisine, bolivian food, competitiveness. Bookmark the permalink.